Martin Mbalu always had a dream of owning a restaurant which made him think of converting his home in Kitengela into a restaurant. His wife Mary was very supportive of the idea since she loved cooking. 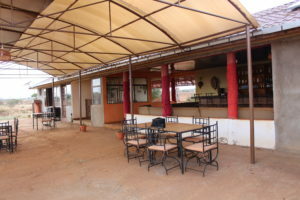 In 2010, Martin and his wife went for a vacation at Ol Tukai Lodge inside the Amboseli National Park. Their stay at the lodge was awesome and their dream to one day own a lodge was ignited. During their stay they did some research to find out why it was very expensive to spend a few nights at the lodge. Their findings helped them come up with their Blue Ocean Strategy which would help convert their dream into reality. They decided to start a low cost lodge along the Oloitoktok highway close to the Amboseli National Park with no electricity bills, no water bills and no renting costs. In 2014, they opened Ambokili Lodge situated between Emali and Amboseli. 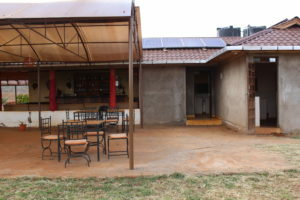 Despite the numerous challenges they faced when starting up the lodge majorly the high capital costs as they had to set up and acquire solar products such as the solar powered pumping system to supply water from the borehole, they also acquired solar water heaters, which is used in the rooms for all hot water needs and also a solar lighting system for lighting up the lodge including the security lighting at night. This costs were however a one-off which translates to huge savings for them as they pay no water and power bills to date. The lodge operates on renewable energy. All electronics run on solar with the borehole supplying all the water while the kitchen is gas powered. They bake with a charcoal oven. This is prove enough that one can run a business or a home fully on solar. To them, Mr. Mbalu and his family are also proud that they are reducing the carbon footprint and going the sustainable way. They also attest that their business has not at any day been at a halt as a result of solar failure. We are proud to be part of this success. We have partnered with leading manufacturers to provide sustainable power and water solutions that fit your specific need. Transforming Communities. Changing Lives.